Joe Papin is a reporter. He works for one of the largest newspapers in United States—the Daily News—and has covered some of the most historic moments in recent American history. His professional title is artist. The tools of his journalistic trade are not the notepad and typewriter, rather an assortment of pens and a sketchpad. For the past 10 years, Papin has been drawing scenes of life—the grand and the commonplace—for the Daily News, not through the humor of the comics nor the commentary of the editorial page, but from a straightforward, objective viewpoint. Papin was in Denton last week, visiting with his old college friend, Brandon Barnes, and promoting a lecture tour and possible syndication of his work by Texas newspapers and magazines. He reflected on his work, the Daily News and the direction of American journalism today. Although thoroughly dedicated to his work and seemingly secure in his position with the Daily News, he is not awed by either his title or the people who employ him. "It has its good points," he said, referring to the Daily News, "but it has a whale of a lot of bad points. Mainly because it's so gigantic. The bigger it is, the more difficult it is to get authority to do dramatic things." The "dramatic things" he would like to see done involve using sketch artists more in the place of photographers. Most of his work has been in courtrooms, where photographers are forbidden. He has covered all the major trials—Watergate, Patty Hearst, David Berkowitz. His work has garnered him display on several front pages and magazine covers and even in a book (his illustrations from the Watergate hearings appeared in Leon Jaworski's recently published "The Right and the Power”). But Papin isn't content to do just the trials. He has come out of the courtroom and invaded the areas usually reserved for photographers. He has drawn carnivals, rock concerts, inaugural speeches by presidents and other politicians, parades, horse races, prostitutes, hospital emergency rooms and thousands of street scenes. "Papers tend to use photos when they can," he said, “and this is based on a very closed-minded view of the editor toward art work, and the common denominator of the photograph," he said. "But photos, except in the hands of the very skilled, tend to become a workaday thing. I don't think that there is anything that the artist can't be as effective in capturing as the camera is." This cause hasn't endeared him to many photographers, nor has it been readily accepted by his editors or readers. "There will always be someone at the paper that doesn't like it because it's different," He said. "It hinges on so many people and they tend to be awfully cautious." As for the readers, they are programmed to expect photos, in addition to being apathetic toward the newspaper in general, he said. "Most people are not used to seeing artwork in the paper except in ads and in the courtroom situations, he said. "And the Daily News is like other papers; it's struggling because the audience is indifferent to newspapers anyway." Papin opened his journalistic drawing career at the top. After graduating from Ohio State University with a degree in art and serving a stint in the army (where he made training films), he headed for New York, determined to make it as a free-lance artist. He wandered the streets of New York, drawing street scenes and trying to sell his work. His big break came in 1957, when Russell Lyons at Harpers Magazine commissioned him to do a series on life inside the New York Times. After several weeks of roaming the Times’ offices, frantically sketching what he saw, Harpers published five pages of his drawings and “the rocket took off from there and I haven't had so much trouble selling my stuff since," he recalled. For the next 12 years, he free-lanced, mostly for McGraw-Hill publishers, whose main publication was BusinessWeek. He longingly recalls those days when, "there wasn't anything I could bring up that the art director wouldn't think was a good idea," starting with his coverage of United Nations and Kruschev’s visit. In 1967, a change in management at BusinessWeek brought on a new image, one that did not include the type of work Papin had been doing. Several of the publications that he had been selling free-lance work to were going out of business and others were in trouble. Michael Newman, who was managing editor of the Daily News at the time, had noticed some of Papin’s work in Washington, and invited him to join the staff as a reportorial artist. Although the Daily News job has given him the financial security needed to raise a family of five and the opportunity to be in on some of the top news events, Papin still covets the freedom of free-lance. "If you must mention my hair," the 46-year-old artist said of the short ponytail tied at the back of his neck, "please say that it is my way of telling my bosses at the Daily News that Joe Papin, despite all that they have tried to do to make me think otherwise, still walks to the beat of his own drummer." "(The Daily News) is so big that what you miss most is the autonomy to do what you think is a good idea and have a clear channel and a clear shot to try to convince somebody that it's worth doing," he continued. One of his latest ideas has been an ongoing historical Journal of America, with syndicated sketches depicting life as it unfolds. He is also currently negotiating with Readers Digest Books to publish a book of drawings on 15 key trials in United States. That book would be his 46th. The lecture tour is both a method of promoting these ideas and a way of educating other journalists, especially those in decision-making positions, on the value of art, not in place of but in addition to photography. "Effective use of graphics is the key to survival of any newspaper," he said. "Editors who can see to use art and pictures have a marvelous, and successful, combination. " "Unfortunately, the people who make the decisions about how art will be used don't know anything about drawing, and publishers don't say, "Well, you've done all these great things, so you do whatever you think would be good." But he is confident about his cause and the future of art in the ever-changing journalism world. "There have been a lot of new people and ideas at our paper and there is a tremendous effort to regain leadership," he said, noting that the same thing is happening across the nation. "Many of the big things I've gotten done have been accomplished by meeting people who were willing to see things done in a different way." His advice to upcoming artists reflects both his feelings about his past and his hopes for the future. "I would tell them anything is possible, "he said. "If they set their minds to it and help themselves by constantly striving, they can do whatever they want." 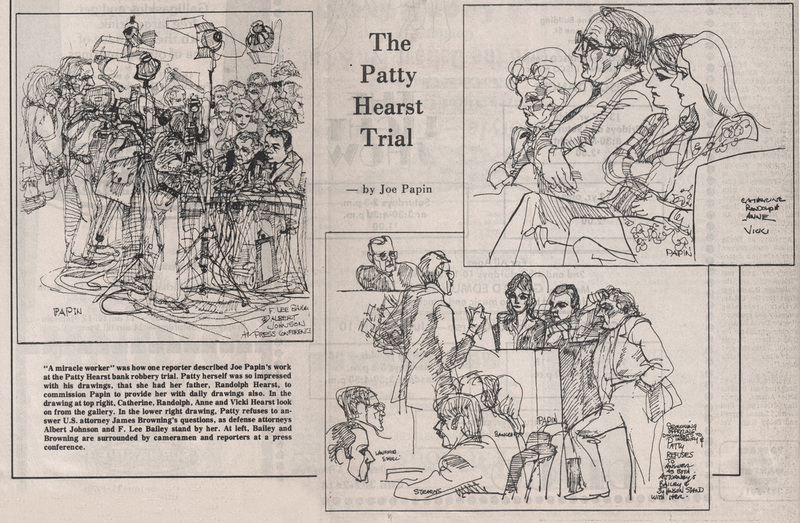 "A miracle worker” was how one reporter described Joe Papin’s work at the Patty Hearst bank robbery trial. Patti herself was so impressed with his drawings, that she had her father, Randolph Hearst, to commission Papin to provide her with daily drawings also. In the drawing at top right, Catherine, Randolph, Anne and Vicky Hearst look on from the gallery. In the lower right drawing, Patty refuses to answer U.S. attorney James Browning’s questions, as defense attorneys Albert Johnson and F. Lee Bailey stand by her. At left, Bailey and Browning are surrounded by cameramen and reporters at a press conference. Joseph Papin is a reporter who has never touched a word processor. His pen interprets a story with images rather than words. The Aberdeen Township resident, who is a bit coy about his age ("39 and holding"), has worked as a New York Daily News courtroom artist for the past 20 years. This pony-tailed man of a million pens has observed and drawn a parade of courtroom personalities, sometimes notorious: John Gotti, Joel Steinberg and Bess Myerson, to name but a few. Papin lives with his wife and three other five children in a knickknack-studded home in the Strathmore section, where he indulges his major non-artistic pastime, collecting. He collects just about any kind of knickknacks: buttons, figurines and die-cast metal cars are his favorites. All are lovingly arranged on shelves in his converted garage studio. Guests may be given a figurine, perhaps of Roger Rabbit or Betty Boop, as a souvenir of his or her visit. Papin has enough die-cast cars to fill a parking lot, dating from his youth to today. Papin was born in St. Louis, and spent most of his young life in Westerville, Ohio. After graduating from Ohio State University and serving in the Army, he free-lanced for 12 years before joining the Daily News as a staff artist. His free-lance work led to his job at the Daily News." Mike O'Neill, then managing editor, and Floyd Barger, editor, saw my stuff in Business Week and liked it a lot," he said. "They had me come by, and I got the job." Papin was influenced by Felix Topolski, an artist who traveled throughout England recording the devastation of World War II. "He drew the war as he saw it," Papin said, “and put out his own journal of the drawings, something I have always wanted to do." With the increasing influx of cameras into the courtrooms at major trials, Papin is among a dying breed. The cameras concern him, not only because what it means for the livelihood of artists, but for the lack of creative interpretation. He gives the edge to the artist because of their perception that can't be duplicated mechanically. "We watch people, understand people, know anatomy, know perspective. We can pretty much cast within objective grounds a scene, and show what's happening," he said. Always a witness to New York's hardest hitting trials Papin is currently covering the trial of hotel tycoon Leona Hensley on tax invasion charges, including allegations that she and her husband, Harry, deducted, as business expenses, renovations on their Connecticut estate. One of the more memorable trials he drew was the 1987 trial of John and Gene Gotti on charges of racketeering, among others. Papin was amazed and impressed by their presence. "It is quite a show," he said. "These guys travel like the Kiwanis Club, but on a more violent basis." Appearances meant a lot to Gotti and his co-defendants, Papin said. "They would come over and critique how they look, being very concerned with how they appear. These guys don't want to be seen with double chins or receding hairlines or anything." Papin told Gotti, "I have to do the best by everyone I draw." Gotti again voiced his disapproval, turned on his heel and went back to his seat. As Papin recalled, Gotti appeared satisfied with his own portrayal. Although the Joel Steinberg trial was primarily photographed, Papin did draw his arraignment and he went to New York's Bellevue Hospital to cover the arraignment of Hedda Nussbaum. The precautions were such that only two or three of the 12 artists who showed up where to be allowed in her room, Papin said. He won the draw and went up. "The judge told us we had 15 minutes at the most, that this woman was in no condition for these procedures to be prolonged. They wheeled her in and I never saw a more battered, smashed, beaten woman in my life. He (Steinberg) had battered her so that she was just a lumpy mass of barely functioning humanity," Papin said. Papin also drew some of the Watergate proceedings. On his vacation time, he went to Washington and was introduced to North Carolina Sen. Sam Ervin, who is chairman of the Select Committee looking into Watergate. Ervin got him a seat in the front, Papin said, telling him "you can have any seat but mine." Tempers ran high at the Howard Beach trial in Queens, in which several white youths were accused of chasing a black man onto the New York highway, where he was struck by a car, and assaulting another. The case got under way with the defendants and their parents on one side, he said, and the blacks on the other. One powerful moment came, Papin said, when assault victim Cedric Sandiford retold what he said to the defendants at the time of the attack. "I've got a son about your size, your age, please spare me, please don't kill me!" Papin was charmed by Bess Myerson, he said. Ms. Myerson, as New York Cultural Affairs Commissioner, hired Sukhreet Gable as an assistant. She was eventually accused of trying to influence Ms. Gable’s mother, Judge Hortense Gable, who was presiding over the divorce settlement of Ms. Myerson's lover, New York sewer contractor Andy Capasso. "Bess Myerson has been Miss America, and it had the overtones of everything, success, lust, adultery, high living, and government people like Mayor Koch," Papin said. He recalled a conversation he had with her during jury selections. "She looked at my drawing; I had her sitting on the edge of the table." She approved of his portrayal of her posterior, he said. "I got to know her after a little while, and she offered me a candy bar one day. She had a purse full of candy bars and said I could have a Hershey Bar with nuts or without; I chose mine without," Papin said." She told me that when I drew Andy (Capasso) to emphasize the fact that he has those wonderful Italian eyes. I said I would pay attention." When courtrooms were closed to photographers in the 1930s, in the wake of media attention that threatened to turn the Lindbergh kidnapping trial into a travesty, the contemporary courtroom artist came to prominence. Although drawing such dramatic scenes was far from new—one thinks of Daumier’s view of 19th century French courts of justice, and of William Glackens’ and John Sloan’s drawings for newspapers in the early part of the century—the idea of drawing for a daily or television deadline was something different. 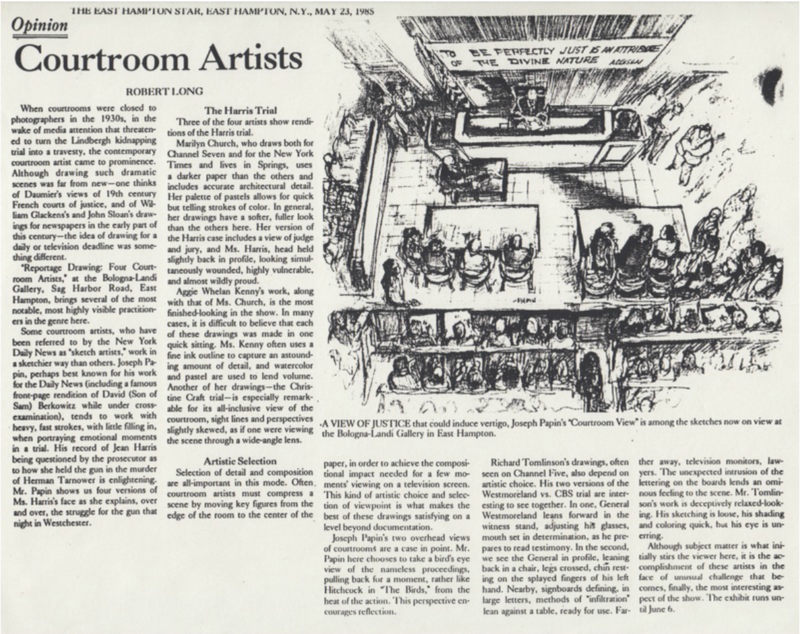 "Reportage Drawing: Four Courtroom Artists," at the Bologna-Landi Gallery Sag Harbor Road, East Hampton, bring several of the most notable, most highly visible practitioners in the genre here. Some courtroom artists, who have been referred to by the New York Daily News as "sketch artists," work in a sketchier way than others. Joseph Papin, perhaps best known for his work for the Daily News (including a famous front-page rendition of David (Son of Sam) Berkowitz while under cross-examination), tends to work with heavy, fast strokes, with little filling in, when portraying emotional moments of a trial. His record of Jean Harris being questioned by the prosecutor as to how she held the gun in the murder of Herman Tarnower is enlightening. Mr. Papin shows us four versions of Ms. Harris's face as she explains, over and over, the struggle for the gun that night in Westchester. Three of the four artists show renditions of the Harris trial. Marilyn Church, who draws both for Channel 7 and for the New York Times and lives in Springs, uses a darker paper than the others and includes accurate architectural detail. Her pallet of pastels allows for quick but telling strokes of color. In general, her drawings have a softer, fuller look than the others here. Her version of the Harris case includes a view of judge and jury, and Ms. Harris head held slightly back in profile, looking simultaneously wounded, highly vulnerable, and almost wildly proud. Aggie Whelan Kenny's work, along with that of Ms. Church, is the most finished-looking in the show. In many cases, it is difficult to believe that each of these drawings was made in one quick sitting. Ms. Kenny often uses a fine ink outline to capture an astonishing amount of detail, and watercolor and pastel are used to lend volume. Another of her drawings—the Christine Craft trial—is especially remarkable for its all-inclusive view of the courtroom, sight lines and perspectives slightly skewed, as if one were viewing the scene through a wide-angle lens. Selection of detail and composition are all-important in this mode. Often courtroom artists must compress a scene by moving key figures from the edge of the room to the center of the paper, in order to achieve the compositional impact needed for a few moments’ viewing on a television screen. This kind of artistic choice and selection of viewpoint is what makes the best of these drawings satisfying on a level beyond documentation. Joseph Papin’s two overhead views of courtrooms are a case in point. Mr. Papin here chooses to take a bird’s eye view of the nameless proceedings, pulling back for a moment, rather like Hitchcock in “The Birds,” from the heat of the action. This perspective encourages reflection. Richard Tomlinson's drawings, often seen on Channel Five, also depend on artistic choice. His two versions of the Westmorland vs. CBS trial are interesting to see together. In one, General Westmoreland leans forward in the witness stand, adjusting his glasses, mouth set in determination, as he prepares to read testimony. In the second, we see the General in profile, leaning back in a chair, legs crossed, chin resting on the splayed fingers of his left hand. Nearby, signboards defining, in large letters, methods of "infiltration" lean against a table, ready for use. Farther away, television monitors, lawyers. The unexpected intrusion of the lettering on the boards lends an ominous feeling to the scene. Mr. Tomlinson's work is deceptively relaxed-looking. His sketching is loose, but his eye is unerring. Although subject matter is what initially stirs the viewer here, it is the accomplishment of these artists in the face of unusual challenge that becomes, finally, the most interesting aspect of the show. The exhibit runs until June 6. A view of justice that could induce vertigo, Joseph Papin’s "Courtroom View” is among the sketches now on view at the Bologna-Landi Gallery in East Hampton.